I am in love with the Sleek items. I love red blush and red lips! I’m definitely going to ask The Boy to haul those for me while I’m away. I’ve not tried All For Eve but ouchies at that £90 price tag! Red generally makes me look like I’ve got a rash, but I’m loving the Sleek Pout Polish & Blush! Re Sleek… red blush? How do you wear that and not look like the creepy clown from It? Am I missing some beauty secret here? i swatched that Sleek blush today, HORRIFIC! in-fact its still on my hand and my mum asked where i cut myself, go figure! How lush is Illamasqua? I love that brand! jesus christ on a red motorbike, how DO you wear that blush??? Oh and makeup brands giving iffy 5% and 10% of their sales to some good cause? THIS is how you do charity. Kudos to All for Eve for giving 100% of the profits from this campaign! 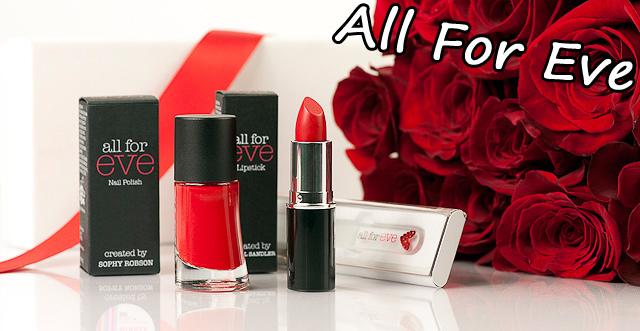 It should be noted that the Sleek Valentine’s collection is limited edition – very limited. I saw the Sleek collection out in my Superdrug, so it’s already launched. 😉 I only tested the Pout Polish, it’s VERY pigmented and so is the blush, but that’s something I wouldn’t use for sure. I wouldn’t get away with Sleek’s red blush as I’m super fair, but I’m sure darker skinned folk might do better with it than I.
I will have to get the Pout Polish. I love Pout Polish, so very excited that there’ll be a red one. Loving Load and Scorn a whole big lot. I’m wondering if that pout polish will be like an OCC lip tar…ooo I like the look of that Illamasqua lipstick! Maybe I will break out of my comfort zone and try a red this Valentine’s Day. On the lips though, no way on the cheeks. They are red enough! I got the Sleek blush and love it so much! Hot pinks and reds seem to do it for me (Mac’s Blooming Cheek, anyone?). It’s necessary to use a very light hand and blend well but I achieve a really nice flush, as if I’ve just exercised. It’s rare to see blushes so intense so I was really excited :D. Seems like I’m one of the few who can get away with wearing it, lol. At last! A reason to look forward to valentines day this year, majorly lusting after the Sleek goodies.